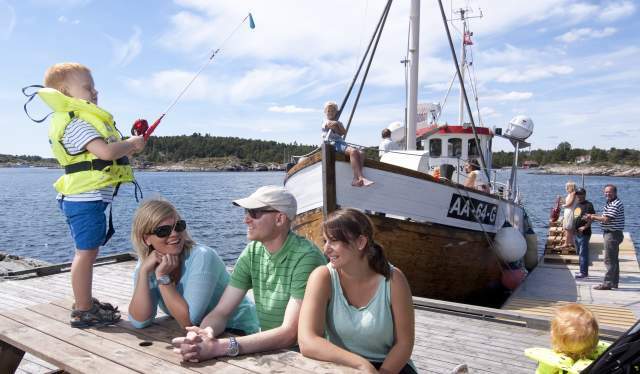 In Grimstad, both locals and visitors enjoy access to an array of islands and islets with small, idyllic beaches and smooth, rocky shores ideal for sunbathing in summer. Østre Flatholmen in Grimstad, Norway. Grimstad’s skerries are ideal for memorable summer days spent together with friends and family. From town, these gems can be reached both with and without a boat. Best of all – most are open to the public, and many have quays for easier access and also toilet facilities. Store and Lille Hampholmen are two popular islands offering numerous beautiful, secluded bays with small sandy beaches. The straits between and around the islands are almost always sheltered from the wind, and there are quays and toilet facilities available. 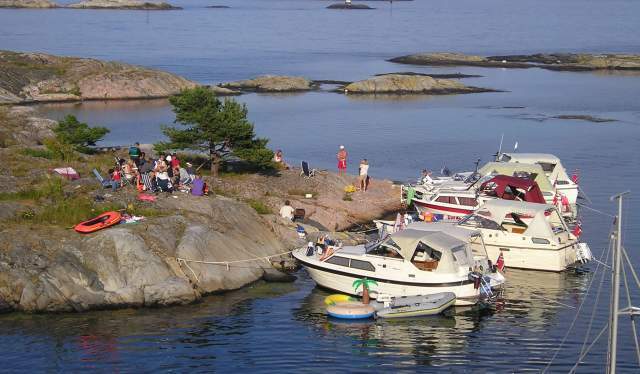 Teistholmen is the perfect spot for families, and has a beautiful sandy beach for the very young and a smooth, rocky shore for those a little bit older. At the centre of the island, there are exciting potholes to explore. Quay and toilet facilities are available. Ytre and Indre Maløya are two large islands with numerous beautiful mooring spots. At Ytre Maløya there is a large field ideal for overnight stays, and there are also quay and toilet facilities available. Valøyene is a group of islands and islets with small picturesque bays and sandy beaches. Their natural stone is the beautiful, red Fjære granite. Auesøya is a landscape conservation area, and is renowned for its spectacular springtime daffodil display to which special guided trips are arranged. Toilet facilities are available on the island. Stunning spots by the sea possible to reach by car or bicycle can also be found. Marivold is a peninsula with its own camp site, and offers beautiful beaches and bays ideal for swimming and fishing. The views are spectacular, and at the outermost shores you truly feel like being in the middle of the archipelago. This is also the feeling you get when visiting Kalvehageneset in Homborsund, where you have a direct view to Homborsund Lighthouse and are refreshingly exposed to the weather. Kalvehageneset is ideal for hiking, and offers excellent swimming and fishing opportunities. The Reddal Canal runs from Strandfjorden (the sea) to Landvikvannet (inland lake), and is 3 kilometres long. From Landvikvannet, you can then reach lake Reddalsvannet through a 500-metre-long canal. This 3.5-kilometre journey will take you from archipelago and lighthouse to inland lakes surrounded by beautiful agricultural land and farms. The canal is ideal for smaller boats, and also perfect for canoeing or kayaking. At Hesnes, you will find the small Hesnes Canal – a great option when you are on your way from Grimstad to Hesnesøyene and Valøyene. The canal was originally built to provide customs officers with a route from the Hesnesøy habour to the Groosefjord harbour without having to navigate the harsh and exposed Smørsundet strait. 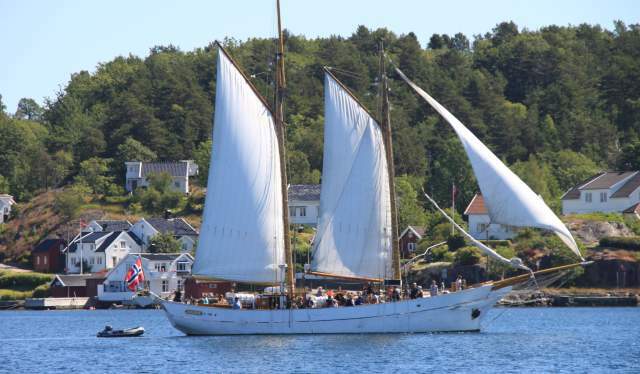 The schooner Solrik and old fishing vessel Østerøy are both excellent ways to explore Grimstad&apos;s skerries. Solrik will take you on a beautiful round-trip amongst islands and islets, whereas Østerøy runs two scheduled trips daily and offers you the opportunity to hop off on one of the island and then be picked up a few hours later. If you prefer to explore the skerries on your own, it is possible to hire a basic 15-foot open boat, with an 8hp outboard motor, from Grimstad Tourist Office during the summer season. Enjoy an experience of a lifetime at Homborsund Lighthouse. Open for overnight stays throughout the summer season. The rest of the year, you can rent the entire lighthouse and bring your family or friends along on a salty adventure. Boat transport required.